Gone are the days when you would think otherwise when prompted with the idea of riding a bicycle. Thanks to technology technological innovations and the corresponding changes in regard to bikes. The convenience that comes with modern folding electric bikes is amazing. In the past years, very few people would be comfortable with the idea of paddling a bicycle up a hill, not to mention arriving at your workplace so sweaty. Well, the story has completely changed today, even the mindset towards riding a bicycle to work is completely different. With the state-of-the-art folding electric bikes, you can always ride your bike several miles without going through the hassle of paddling. Even more interesting is the fact that these bikes feature a compact, lightweight and foldable design making it a breeze to move around with or store. Depending on the model, electric folding bicycles can be used to travel at up to speeds of 45km/h. Top on our list of the SWAGTRON E-Bike that comes with the SwagCycle. Featuring an aluminium-grade construction, this zero-emission transportation device has a 10-mile range. 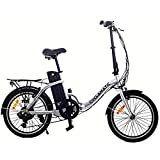 If you want to ride to your workplace or back home in style, SWAGTRON Folding electric bike got you covered. Another pretty awesome aspect of this bike is the collapsible design that makes it possible to store it in the trunk of any car or fit it under the desk. The micro USB Charging port allows you to charge all your devices. After a 2-3hours charge, this beast can keep you going for up to 10miles, thanks to the powerful 36V battery. Ride like a pro as you enjoy the SwagCycle style without messing with the environment, owing to its zero-emission. You can break, honk a horn or even check your battery life at the handy handlebar components while bustling through town. This is another outstanding model that you will enjoy riding on any standard terrain. Cyclamatic CX2 is a great choice for those with minimal storage space and love to bustle around during holidays. 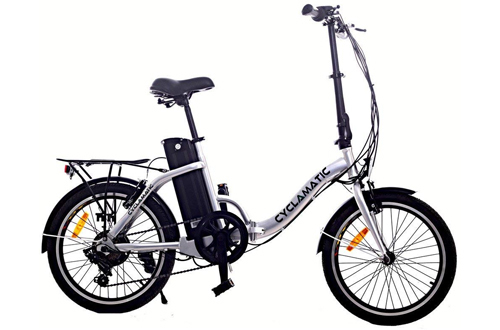 Featuring a 6-speed gear system and an upgraded battery, Cyclamatic gives you a perfect ride with little paddling effort. When you begin pedalling, the upgraded 250W motor takes over making your ride smooth and effortless. Good news is, you can decide to ride the electric way or just ride as if this were a standard bike. Versatility is top-notch, everything you need to customize your ride is at the handlebar, including the three levels (low, medium and high) of pedal assist. In less than 5 minutes you can fold this bike into half and store it anywhere with less floor space, thanks to the unique quick-lock-release mechanism. Expect to enjoy a 25-31 miles ride on a normal terrain after 4-6 hours battery charge. Moreover, the battery level indicator helps you estimate how far is too far while the very low self-discharge preserves power. Other robust features include electric lights, bell, v-brakes, and reflectors. Overall, this is one of the best folding electric bikes out there. 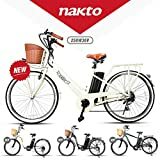 NAKTO Electric Bike is another convenient way to ride through a bustling city over the holiday without spending a dime on fuel. One lovely aspect of this bike is the quick-release clamp that enables you to quickly snap-fold this bike into half for convenient transport and storage. Moreover, it boasts plenty of saddle height adjustment, a feature that allows many users to enjoy a ride. It is upon you to choose whether to ride the back the standard way or use pedal assist. On a full slow 3-4 hours charge, you can adventure a normal terrain up to 25 miles. The maximum speed for NAKTO is 23milesper hour but you can hit 30 miles when going downhill. 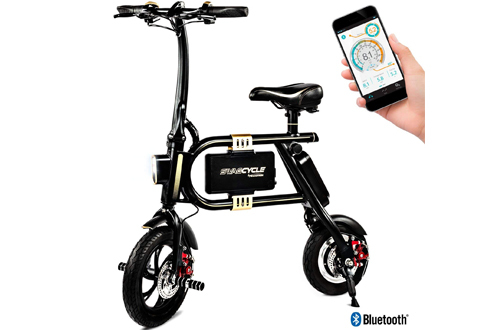 The two major robust features here are the Rear Hub Brushless Motor and the Lithium-Ion Battery that is pretty durable enough to give you a fun ride. To sum it up, NAKTO is an excellent option in an urban setting. 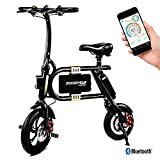 If you are the kind that wants to strike a balance between style, sleek design, and excellent performance, SWAGTRON Swagcycle Folding Electric Bike remains the ultimate choice. 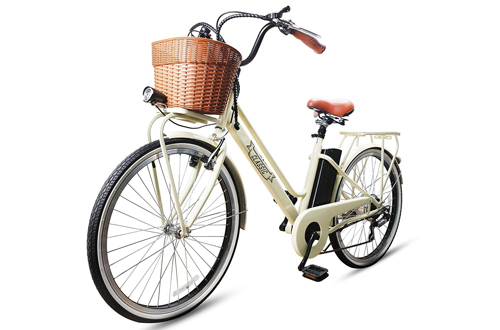 With 10mile range, nothing beats this bike when you use it on your way to class, ride in the neighbourhood or just take a few rides across a bustling town. Boasting an aerospace aluminium grade hardware, this bike is sturdy enough to support up to 264lbs. No more traffic jam, grab SWAGTRON and effortless fly past all cars in town. After a 2.5 hours charge, the Lithium-Ion battery can power this bike for up to 10 miles. Everything you need to control the ride is included in the handlebars. You can honk the horn to clear the way, check the battery status, accelerate, brake, and turn on the headlights when it is dark. When your device is low on battery, use the USB charging port for charging as you enjoy the ride. When you have finally arrived at your station, take advantage of the collapsible stem that allows the bike to fold. Here comes this new brand form Goplus that will see you avoid the traffic jam in style. 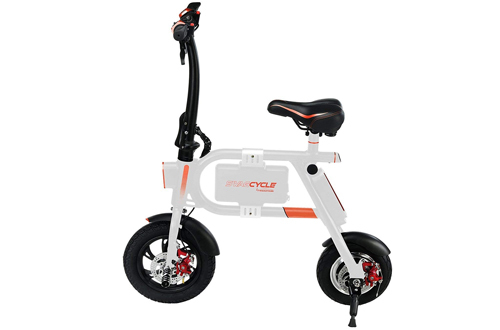 Designed with user-needs in mind, Goplus is one of the best folding electric bikes you can lay your hands on. It boasts some of the best safety features ever. Unlike other brands, it has the front headlights and breaking tail lights that enables you to ride at night risk-free. More amazing is the smart APP that allows you to obtain controller temperature, get instant stats, adjust speed, and even lock the bike. To save on space and easy transport and storage, the bike head folds easily. After a full battery charge, this bike can ride at maximum speeds of 19mph and can endure up to 12.5 miles. Plus, Goplus is equipped with a cruise control system that allows you to ride at a constant speed. Overall, Goplus is an all-rounder bike designed to simplify your life and ride. 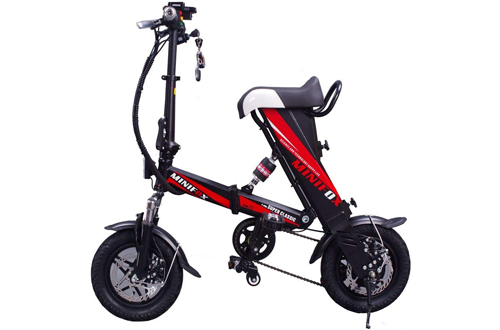 Equipped with 250-Watt high-speed motor, the MEIYATU E-Bike is another top-rated model that boasts a wide range of 15-18. It is also equipped with a durable 18650 Lithium battery that holds the charge for long and lasts compared to other brands. When it is time to pick up your kids from school and the traffic jam is unbearable, grab MEIYATU E-Bike and enjoy a comfortable ride home. You won’t believe how compact this bike looks when folded. Moreover, it is lightweight for making transportation and storage convenient. Hitting high speeds of up to 18 mph, this bike can meet most standard riding needs. To withstand any condition and last for ages, it features high-quality mainstream components and high-carbon steel framed bicycle. Addmotor Motan is a high-end folding E-bike that can be put into any use. It is packed with several prominent features to give you top-notch rider versatility. If power is your priority, Addmotor Motan Folding Electric bike makes a perfect choice. It can cover up to 40-55 miles after a full charge while riding at 23mph at maximum. You can pedal with the level one assist for excellent performance or decide to use motor power alone. Unlike other models that feature a 350W motor, Addmotor Motan has a 500W brushless motor that conquers most standard terrain. You can also ride at night owing to the night mode LCD that ensures visibility. 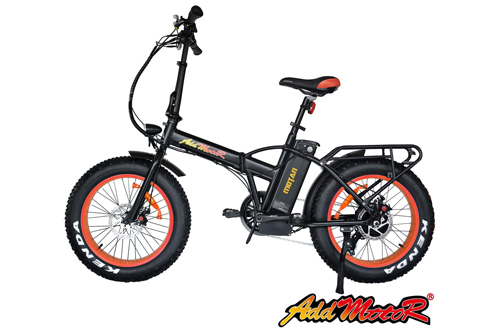 Featuring a collapsible frame, top-tube, and pedals, storing Addmotor Electric mountain bike is hassle-free. Other features include the USB charging port and the 5” LCD Display. 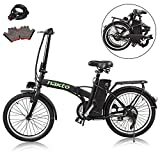 If you like to commute to your workplace or love to ride around, the NAKTO 16” Folding Electric Bike is another outstanding unit worth consideration. It allows you to use the bicycle as an e-bike or rather opt for a pedal assist. Most adorable is the intelligent built-in lithium battery design that minimizes theft cases. Moreover, the batteries are waterproof and can power your bike for a long distance. A full charge lasts about 4-6 hours and can power your bike for up to 9-13 miles on a standard terrain. The powerful brushes 220W motor churns out enough power to make your ride easy and fun. 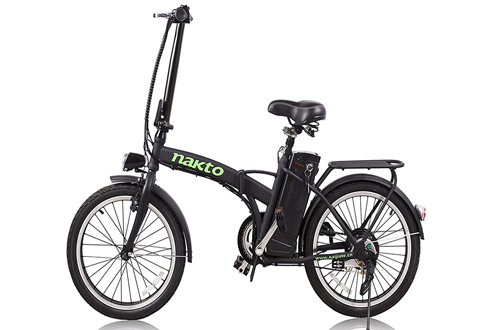 The lightweight steel frame adds style and strength to NAKTO Folding Electric Bike. 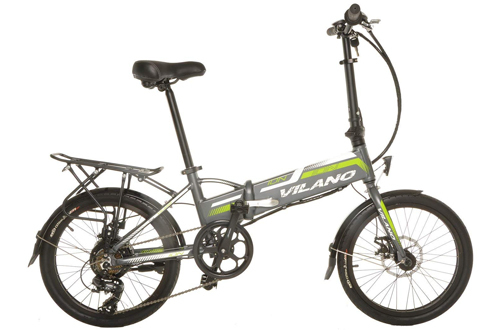 With 250W brushes Hub Direct Rear Drive Motor, the Vilano ION is another awesome bike. If you want to ride in style around town or from campus to home, the 36V Samsung Lithium-ion battery is powerful enough to make your experience fun and effortless. The compact alloy folding frame is sturdy yet lightweight. You can toggle between the 7 speeds as you work up your muscles. Depending on the user and nature of the terrain, you can cover 15-30 miles. 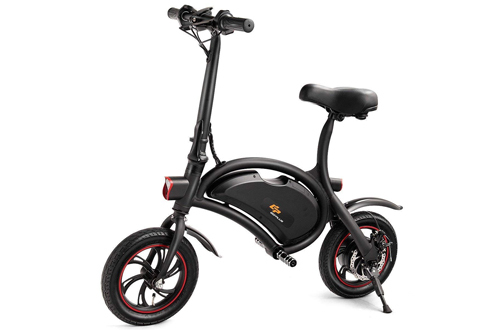 One lovely aspect of Vilano is the built-in Lithium-Ion battery that gives the bike a sleek attractive look. Overall, Vilano ION is a great bike for a ride here and there.